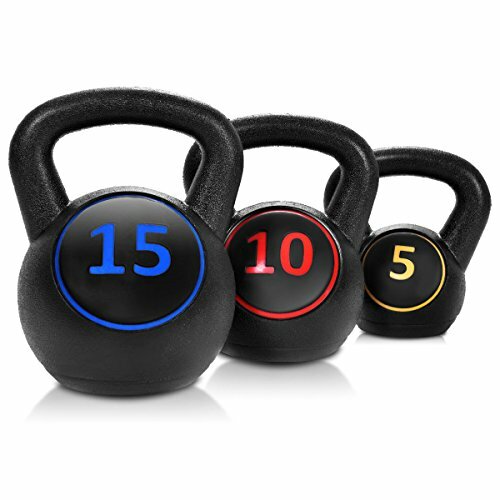 This Is Our New 3 Pcs Kettle Bells, Which Is Perfect For Strength Training And Fitness. For Various Strength Degree Levels, You Could Choose The Appropriate Weight For Your Exercising. Each Kettle Bell Features A Vinly, Cement-Filled Design That Has A Comfortable, Extra-Wide Grip For Easy Maneuvering. Welcome! High Quality With Competitive Price Can Be Realized Here! 【Materia】Our 3 pcs kettlebell set is made of HDPE, concrete material which is cement-filled. 【Grip Design】The extra grip design provide a comfortable grip and easy maneuvering. 【Daily Exercise】It is a great option for getting a whole body workout and perfect for keeping fit. 【Dimension】Grip diameter:1.2";Max holder width: 3.7"/4/"4.3"